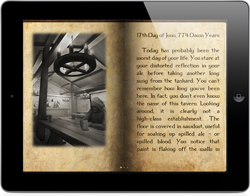 Gamebook Adventures is brought together through the efforts of passionate and avid gamebook enthusiasts. If you are familiar with the Choose You Own Adventure, Fighting Fantasy, Lone Wolf or Grail Quest series then Gamebook Adventures will really appeal to you. Our aim is to give those nostalgic readers of old something new and fresh, and bring a new exciting experience to those unfamiliar with gamebooks. If you enjoy fantasy RPGs or adventure games then this is for you! We have commissioned all new adventures, written specifically to take advantage of the digital medium. We have also found some amazing artists to generate some beautiful artwork to help immerse you in the adventure. It is like having a tabletop game experience that you can pick up anywhere and put down anytime to come back to it later. 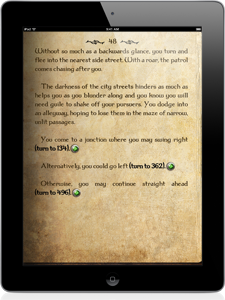 Check out our selection of gamebooks!